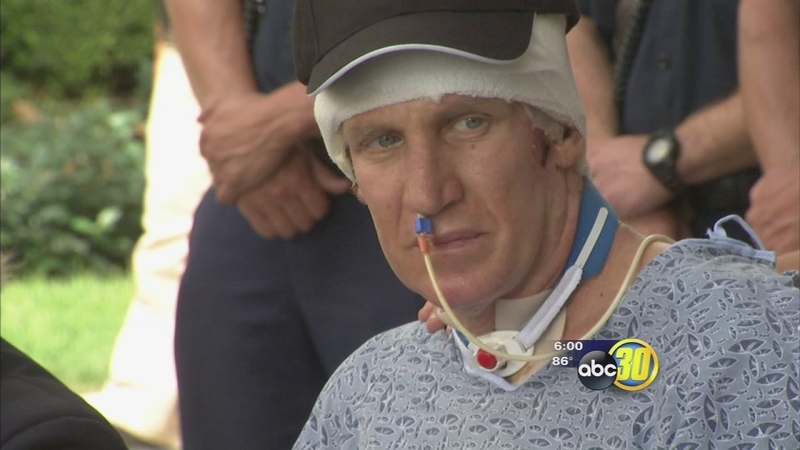 FRESNO, Calif. (KFSN) -- More than three months after a fiery roof collapse sent him to the ground, and then the hospital with severe burns, Fresno Fire Captain Pete Dern is ready to talk. "We've had firefighters around me since the beginning and it's just very comforting to know somebody's there all the time," he said in front of Community Regional Medical Center, where he's been treated at the burn center. We're about 100 days into his recovery and we found out Friday how well it's going. Dern walked to a podium his own to talk to make a statement, and we found out he's basically dancing with his wife to make it easier to take those steps. Cheers greeted Capt. 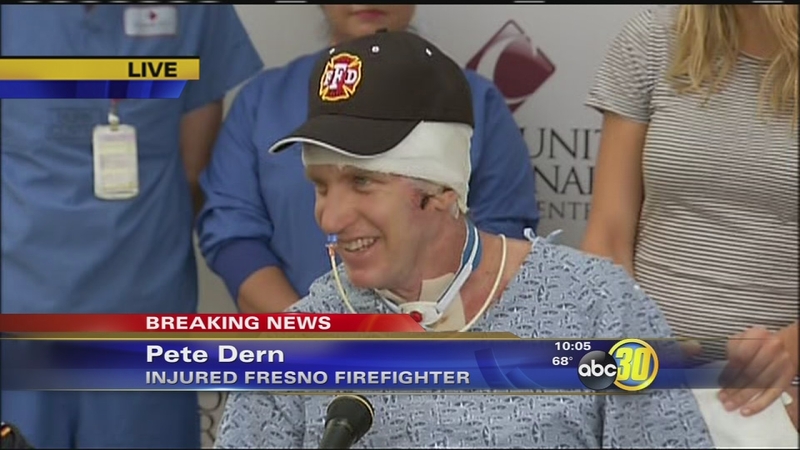 Dern as he walked up to the podium to make his first public comments since he fell into a burning Central Fresno home and suffered burns over about 70 percent of his body. Dern isn't looking back. He's looking forward. "I'm just here today to tell you I'm feeling pretty good," he said. "Dr. [William] Dominic and his staff have done an amazing job putting me back together." Since the March incident, Dern's home has been inside hospital walls. He's had 19 surgeries, dozens of skin grafts and hard rehabilitation to get back to the point where he can walk the halls, and impress the staff. 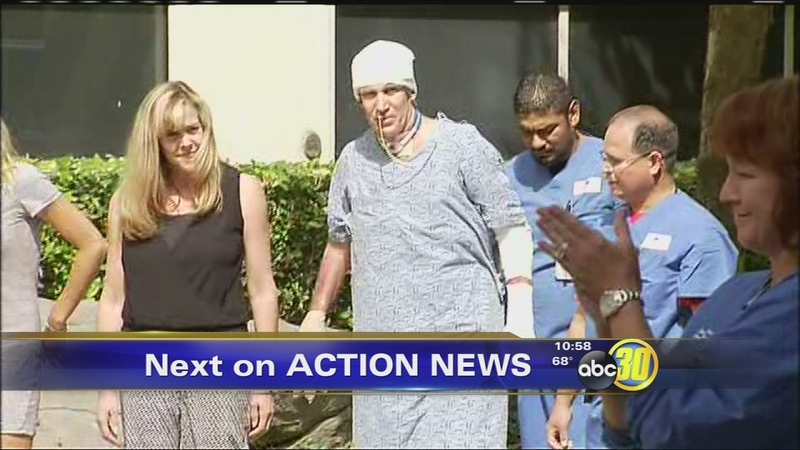 "Glad to see you walking," a CRMC employee told him in passing as Dern walked for his rehab. "Thanks," Dern said. "Glad to be walking." Through it all, his wife Kelly and daughter McKenzie have been by his side. They're heavily involved in his rehab, which has provided some surprisingly romantic moments. "Almost like you're dancing," were the instructions from a therapist as Pete and Kelly waltzed around the hospital corridors. Kelly Dern says they were never good dancers, but she has been a great support. Her husband's hands are still heavily damaged and thickly wrapped, so when he needs to reach out, it's her hands he uses. "Even simple things like getting a drink, I have to have to have a special cup or she just holds a cup with a straw," Pete Dern said. On Friday, he thanked the medical staff and his firefighting family for helping him reach this point in his recovery. But it's clear why he's worked so hard to get home. "My motivation are these guys right here," Dern said, referring to his wife and daughter. "So I want to get back to kind of a normal life -- get out of the hospital and be a family again." Dern still needs at least two or three more surgeries, and he'll need a lot more treatment even after he leaves the hospital, but that day is coming sooner than any of the doctors thought when he first arrived.